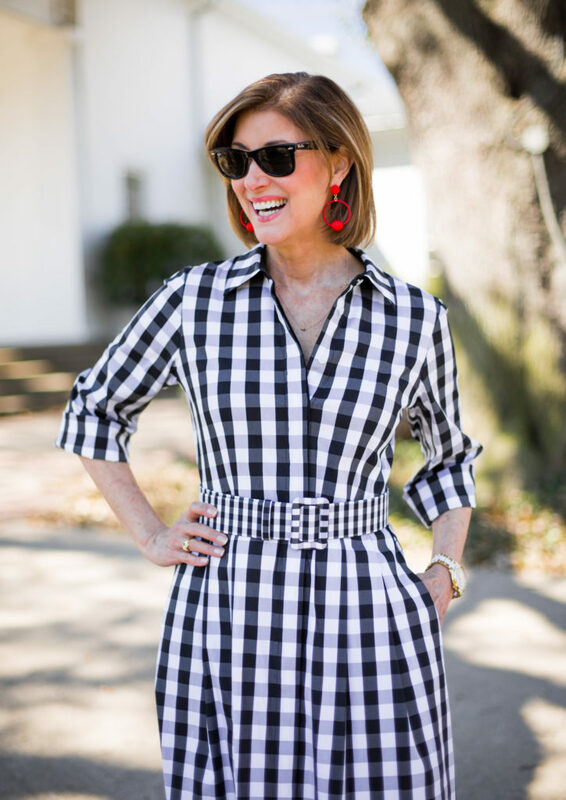 Black and White Check Dress - Fashionomics "every page"
I hope you are looking forward to the Easter weekend. I love this time of year and the beginning of spring and most especially the Easter Celebration!! 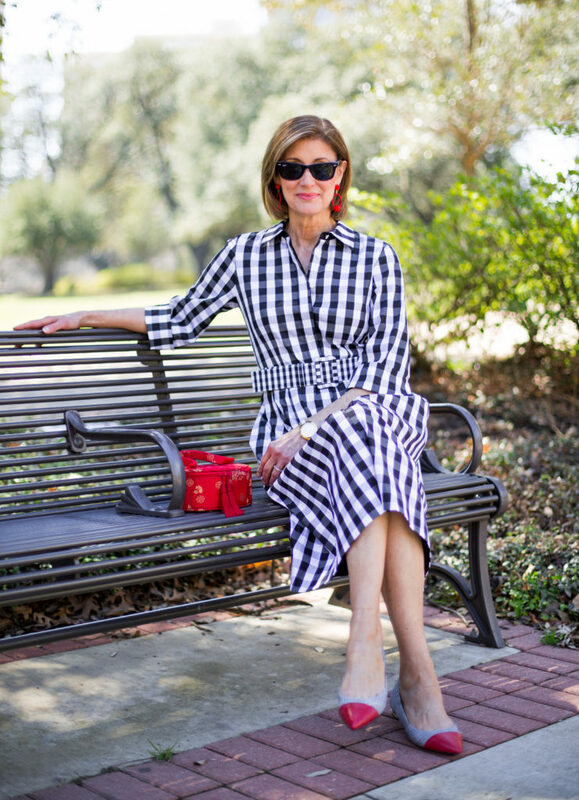 I posted last week about picnics and got so many comments on the black and white check dress I was wearing!!! I had already planned to write about it this week, maybe I should have reversed the order of things. I was shopping at Neiman Marcus NorthPark for something else and saw this dress and fell in love with it. It is crisp and cool and has sleeves and a very flattering style and I think you could dress it up or down. 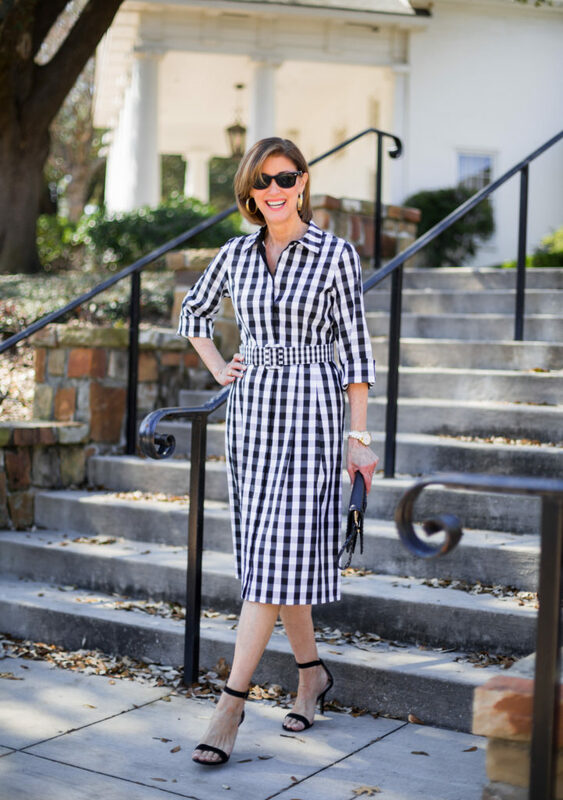 Checks and gingham and black and white are right on trend this spring. It is great for a meeting or lunch or church. It’s the kind of dependable staple in your closet that when in doubt you just grab it and go. 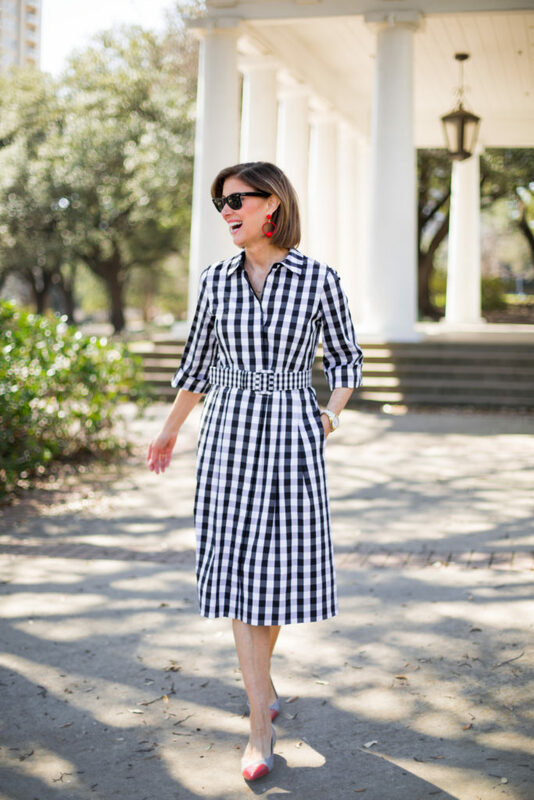 This dress is so easy to accessorize. I just wore my fave Claudia Lobao gold hoops – love her jewelry!! So I like this cute dress with a heel or a flat. It is just easy to wear and so comfy!! It could take you from spring to fall and I couldn’t help adding a little red accent for a hint of color with the black and white. This dress is so easy to accessorize. I grabbed this funny little red chinese purse that I have had for ages. I love a little bag with some personality!! I found these red hoops in New York last September when I was there for NYFW. I always say fashion should be fun and adding a little color gives you some pizazz. I do love a great dress that is easy to wear and comfortable and flattering. This one just fits the bill in every way. My clients alway want a sleeve so here you go. And this fabric is really light weight so you could wear it all summer. I love this dress on you! Happy Easter, Seester!!!! !